IN MARC’S BELLI PIECE OF LAND IN SOUTH MOROCCO, FIVE SMALL WOODEN GUEST HUTS WITH MOVABLE PANELS FOR WALLS ALLOW VISITORS TO FRAME THE MOUNTAIN VIEWS FROM THEIR RATED TIMBER BEDS. 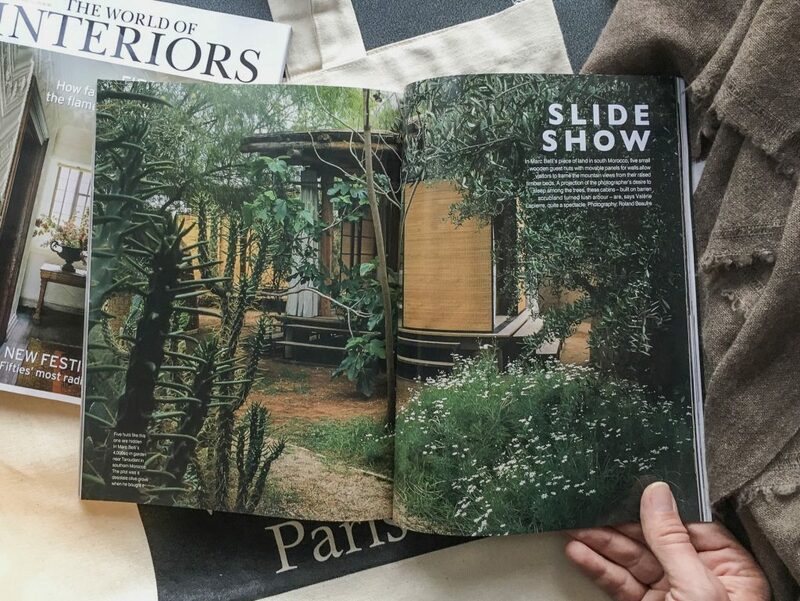 A PROJECTION OF THE PHOTOGRAPHER’S DESIRE TO SLEEP AMONG THE TREES, THESE CABINS -BUILT ON BARREN SCRUBLAND TURNED LUSH ARBOUR- ARE, SAYS VALÉRIE LAPIERRE, QUITE A SPECTACLE. PHOTOGRAPHY ROLAND BEAUFRE. TEXTS BY VALÉRIE LAPIERRE. PHOTOGRAPHS BY ROLAND BEAUFRE. © THE WORLD OF INTERIORS. MARCH 2017. 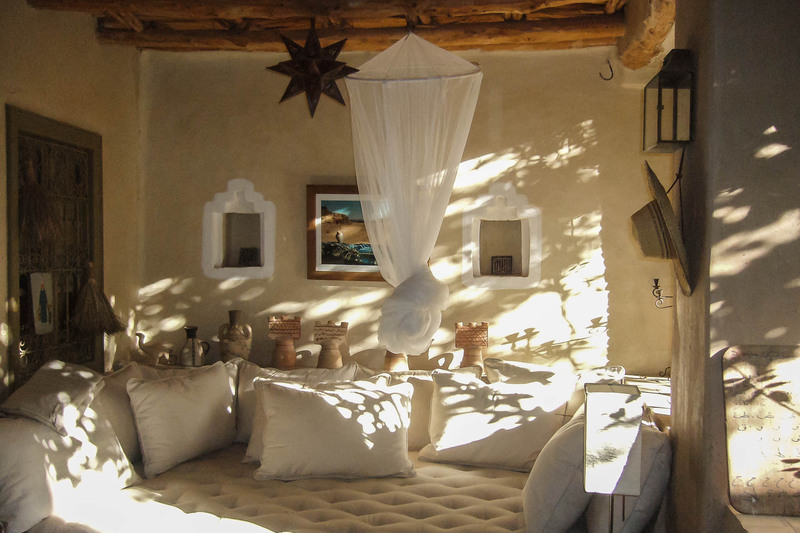 Marc Belli has just realized his dream: to build sleeping cabins in the rural plot he owns facing the Atlas mountains. With his wife, Zahia, he runs a guest-house in Taroudant, southern Morocco.If he shares with many of his contemporaries a desire to get back to nature, Marc, a French photographer and art director, is also in thrall to a certain nostalgia for the ‘paradise garden’ of his youth: that of his grandmother’s villa, where he spent his holidays. Though just a few kilometers from the city, his land is set in what feels like the back of beyond, among the infertile fields of what was once an olive grove. The site, on which there used to be nothing more than a straggly row of trees and a dilapidated cowshed, was not connected to the town, so it was necessary to sink a well and install solar panels. Covering nearly 4,000sq m, this narrow plot is enclosed by a rammed-clay wall. It is reached by a dusty track edged by thorn bushes and cacti. There is nothing to suggest what can be found behind the walls, and no-one could guess that through the main gate is a field of roses and hibiscus by a patio in which jacarandas, euphorbias, palm trees and acanthus are rejected in a huge mirror. Another surprise awaits beyond the patio: an electric-blue raised swimming pool that seems to stretch as far as the eye can see. Thirty-two meters long and built in the middle of the plot, it has on one side an orchard and rose garden facing the mountains, and on the other, fields of olive and fig trees sheltering benches and hammocks. This colourful, elegant structure pays homage to the Jardin Majorelle in Marrakesh (Wol Dec 2007), and the garden of las Arboledas in Mexico, designed by the architect Luis Barragan. 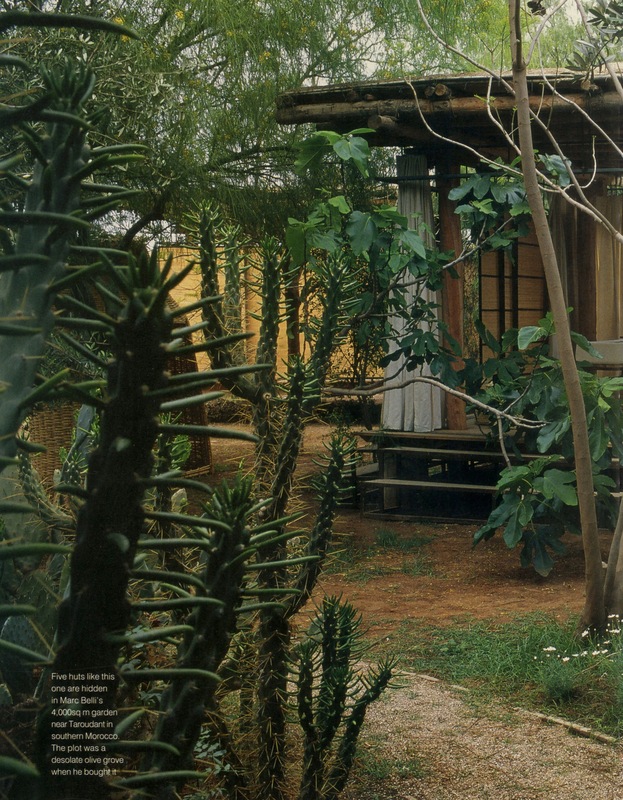 All around, Marc has arranged cacti, agaves, grasses and zoysia lawn. In line with his friends Arnaud Maurieres and Eric Ossart (Wol Jan 2017), the specialists in dry gardens with whom he restored his own earth house, Marc has chosen species adapted to the arid climate that consume little water, while the pool is also used to irrigate the soil. Picturesque pathways dotted with garden seats wind through the fragrant, bushy undergrowth, opening the way through the eucalyptus, pomegranate, citrus, olive and fig trees, aloes, succulents and more. 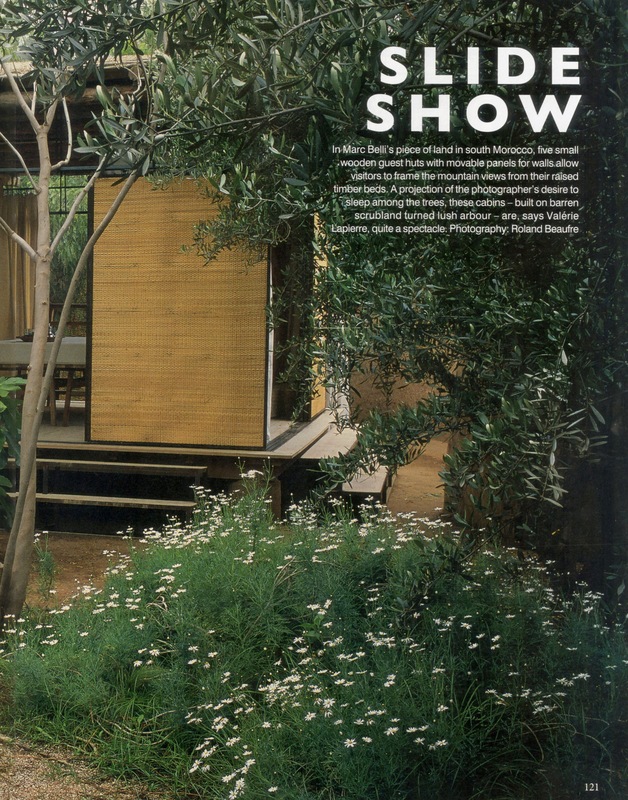 At the far end of the garden, buried among the vegetation, are the five cabins open to guests. ‘They are the result of my frustration at not being able to sleep in the garden. I wanted to feel it physically, to wake up to the sound of toads, crickets and rustling leaves.’ Now in his fifties, Marc, who also lives in Paris, has spent 12 years organizing his life so that he can stay in his Taroudant house as much as possible. As with many of the medina’s inhabitants who own gardens outside the city, Marc bought this plot to enjoy the fresh air. But while the Moroccans are generally content with week-end picnics, he wanted to go further. 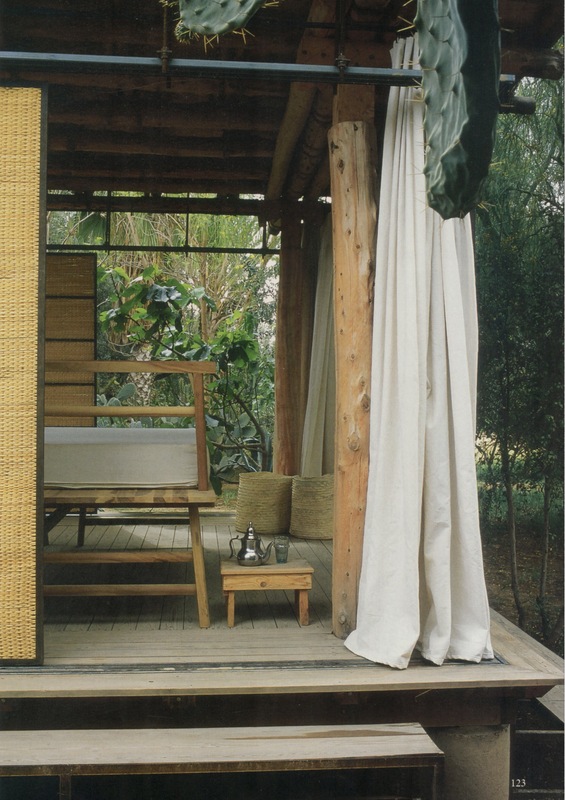 Wooden cubes barely larger than a bed, his cabins are reminiscent of Balinese gazebos or small Japanese tea houses and have been made from local materials. The frameworks and uprights are made of cypress wood, and the ceiling of rush mats tied together with thick string made from drum palms. 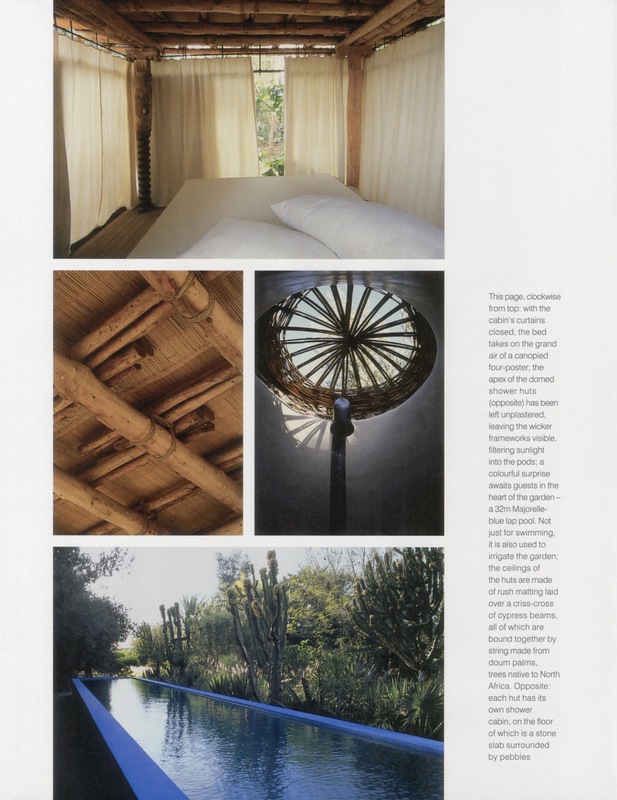 Each cabin is raised above the ground away from snakes and insects, as is the walnut bed inspired by rustic Chinese furniture. Highly sophisticated wood-and-iron rails run round the room, some holding white raw-cotton curtains that hang down to the floor, others panels of rush matting that slide along them, three per side, to close off the cabin. The interplay of shifting walls and curtains make it possible to create different kind of rooms. 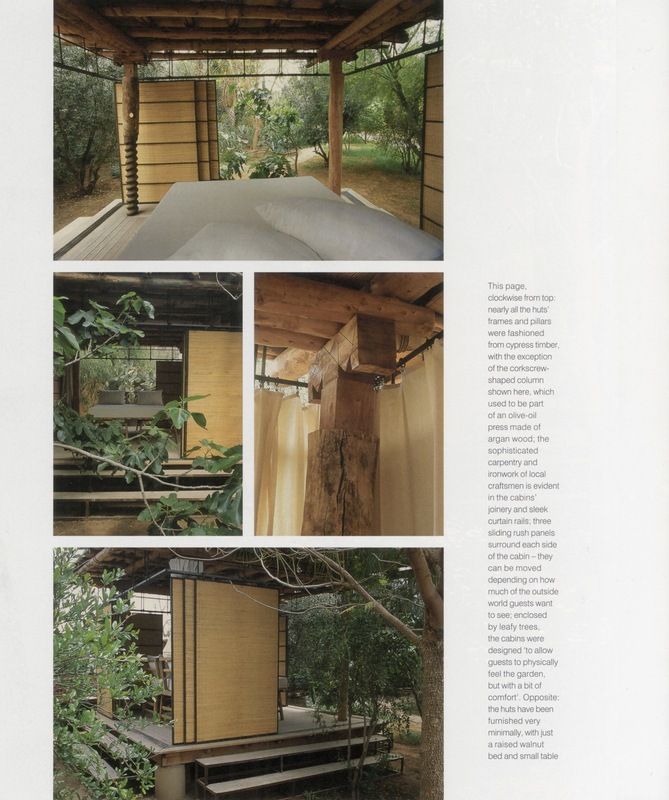 With the walls closed, the cabin has a sobriety that feels very Japanese, but when the curtain are drawn, it becomes a charming and sumptuous four-poster bed among the trees. ‘It’s a place for people who want to be in direct contact with nature, but in comfort,’ Marc points out. 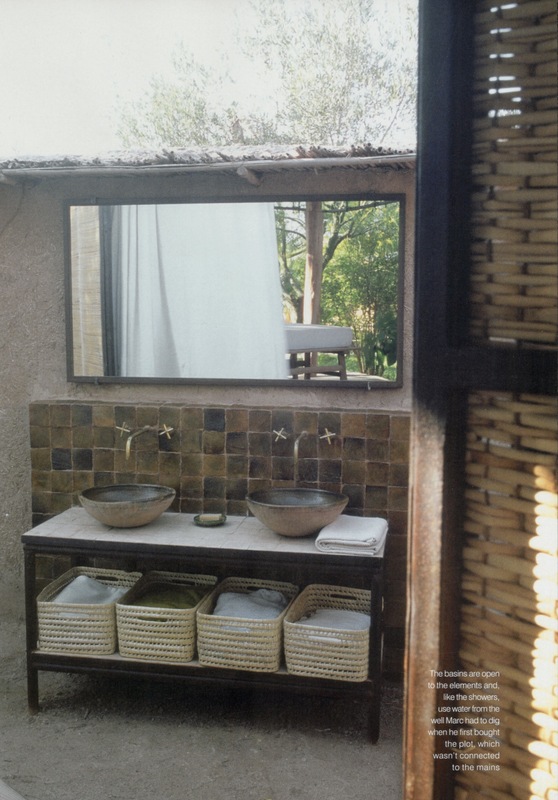 Each chalet has its own sanitary facilities, with one hut for the shower and another for the loo on either sides of open-air-basins. 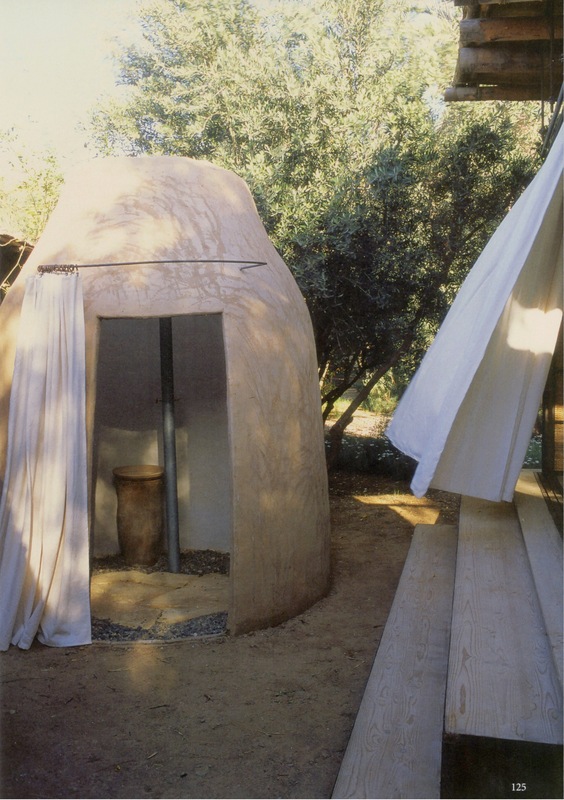 These rooms, made of rammed earth, and closed with a simple curtain, have been moulded on wickerwork forms usually used to make individual hammams. Meals are also provided, prepared in the guesthouse in town a few minutes from the garden. 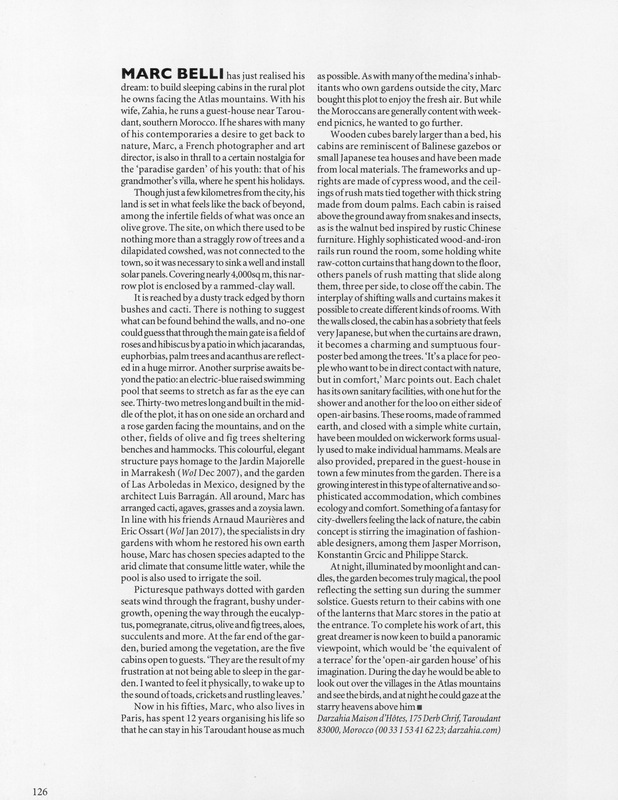 There is a growing interest in this type of alternative and sophisticated accommodation, which combines ecology and comfort.Something of a fantasy for city-dwellers feeling the lack of nature, the cabin concept is stirring the imagination of fashionable designers, among them Jasper Morrisson, Konstantin Grcic and Philippe Starck. At night, illuminated by moonlight and candles, the garden becomes truly magical, the pool reflecting the setting sun during the summer solstice. Guests return to their cabins with one of the lanterns that Marc stores in the patio at the entrance. To complete his work of art, this great dreamer is now keen to build a panoramic viewpoint, which would be ‘the equivalent of a terrace’ for the ‘open-air garden house’ of his imagination. During the day he would be able to look out over the villages in the Atlas mountains and see the birds, and at night, he could gaze at the starry heavens above him. © The World Of Interiors. All rights reserved. March 2017. Next Post Invitation to the opening night of our garden in Taroudant. May 10th 2017.